In our Real Ministries for Real Marriages series, we look at how churches across the country are thinking up ways to meet the needs of couples in their congregations—from those anticipating a wedding, to those seeking to strengthen a healthy marriage, to those grieving a divorce. Twenty-five years ago, Ralph Delgado’s wife had an affair, which resulted in their divorce. It was “an excruciatingly painful time,” recalls Delgado. “I felt so alone.” But today, Delgado, a pastor of community life at Christian Assembly in Eagle Rock, California, serves those going through similar situations by way of the church’s Divorce Care ministry. 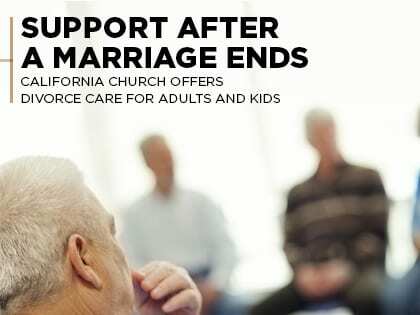 Created in 1994 by Church Initiative, a nondenominational, nonprofit ministry that creates video-based curriculum to help churches minister to people facing life crises, Divorce Care is a 13-week course designed to help men and women process, heal and move on from divorce. Christian Assembly launched their recovery ministries (now called Thrive) in 2001, with Divorce Care as one of its core classes. “Today, nearly everyone who comes to church comes with baggage, pain, hurt or difficulties,” says Jim Cosby, who, at the request of Lead Pastor Mark Pickerill, helped create and start Christian Assembly’s Thrive classes, including Divorce Care. Cosby explains that the church’s leadership categorized the common issues people struggle with and researched Christian resources to help. “Then we added to that a safe, small group process where people could express themselves without fear of being fixed, analyzed or advised,” says Cosby. Christian Assembly—which has an average weekend attendance of 2,800—offers Divorce Care twice a year, with each session drawing about 20 participants, either from the church, friends of church members or even pastors from other local churches who need an anonymous setting to process their own pain. Each class in the 13-week course includes a video teaching and a time for small group discussion and personal response based on the curriculum. Classes cover a range of topics, from facing anger and depression to financial survival, single parenting, new relationships and forgiveness. Children of divorce need a safe space to process and share, as well. They can often feel anger, confusion and even guilt over their parents’ separation. A few years after launching Divorce Care, Christian Assembly began offering DC4K, Church Initiative’s Divorce Care program for children ages 5 to 12. Parents attending Divorce Care classes at the church can bring their kids with them to participate in their own class; sometimes parents who don’t participate in Divorce Care still enroll their children in DC4K. Session topics include “God’s Plan for Me,” “What’s Happening to My Family?” and “Telling My Parents How I Feel.” The gospel message is also clearly presented in each DC4K course.